When compared to one another, multiple informants’ reports of adolescent internalizing problems often reveal low convergence. This creates challenges in the delivery of clinical services, particularly for severe outcomes linked to internalizing problems, namely suicidal thoughts and behaviors. Clinicians would benefit from methods that facilitate interpretation of multi-informant reports, particularly in inpatient settings typified by high-cost care and high-stakes decision-making. 765 adolescent inpatients (70.3% female; Mage = 14.7) and their parents completed measures of adolescent internalizing problems. We obtained baseline clinical and treatment characteristics from electronic medical records. Latent class analysis revealed four reporting patterns: Parent-Adolescent Low (LL; 49.0%), Parent Low-Adolescent High (PL-AH; 11.5%), Parent High-Adolescent Low (PH-AL; 21.8%), Parent-Adolescent High (HH; 17.6%). Relative to the LL class, adolescents in the PH-AL and PL-AH classes were more likely to be admitted with suicidality. In terms of treatment characteristics and relative to the LL class, HH and PH-AL adolescents were more likely to receive standing antipsychotics, PH-AL adolescents were more likely to be in seclusion, and HH adolescents had longer hospital stays. At discharge and relative to the LL class, HH, PH-AL, and PL-AH adolescents were more likely to receive an anxiety disorder diagnosis. Further, HH, PH-AL, and PL-AH adolescents were more likely to receive partial hospitalization or care in another restrictive environment after inpatient treatment, relative to the LL class. This naturalistic study informs clinical decision-making by aiding our understanding of how multi-informant reports facilitate interpretations of adolescents’ clinical presentations as well as predictions about treatment characteristics. The research reported here was supported by the Institute of Education Sciences, U.S. Department of Education, through Grant R324A180032 to University of Maryland at College Park. The opinions expressed are those of the authors and do not represent views of the Institute or the U.S. Department of Education. All procedures performed were in accordance with the ethical standards of the institutional research committees and the 1964 Helsinki declaration and its later amendments or comparable ethical standards. Deros, D. E., Racz, S. J., Lipton, M. F., Augenstein, T. M., Karp, J. N., Keeley, L. M., ... & De Los Reyes, A. (2018). 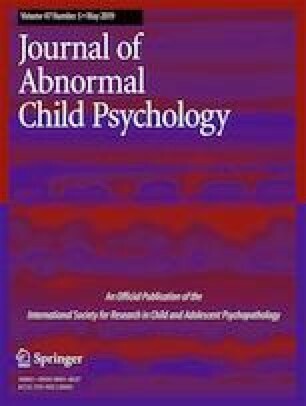 Multi-informant assessments of adolescent social anxiety: Adding clarity by leveraging reports from unfamiliar peer confederates. Behavior Therapy, 49(1), 84–98. https://doi.org/10.1016/j.beth.2017.05.001.